Okay, so maybe not a chimney... but you get the picture. 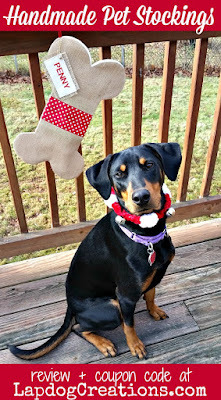 Disclosure: Happy Claude sent three Christmas stockings to Lapdog Creations, free of charge, for review purposes. We only share information that we feel is relevant to our readers, and all opinions expressed are our own. The Christmas trees are being decorated, and those stockings are being hung on mantels, bookcases, and walls... or, in our case, they're being placed under the tree. I've always been a big stocking person. It's just so much fun to find unique little trinkets and goodies in them. I also love to fill them, so it's no surprise that my dogs always each get their own. This year, we've upped the stocking game. Thanks to Happy Claude, each of the Lapdogs now has their own extra special stocking. I am absolutely smitten with the three custom stockings we received. Each one is handmade with love in Happy Claude's San Francisco studio - and it shows! In fact, Happy Claude's motto is "Show Your Love" - for family, friends, and most especially pets. 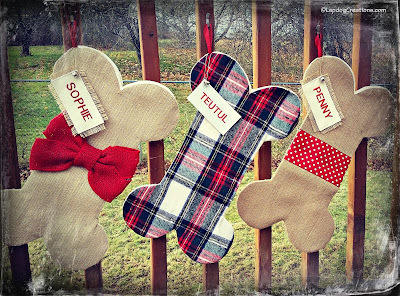 Happy Claude offers individually designed, handcrafted stockings for both dogs (bone shaped) and cats (fish shaped). 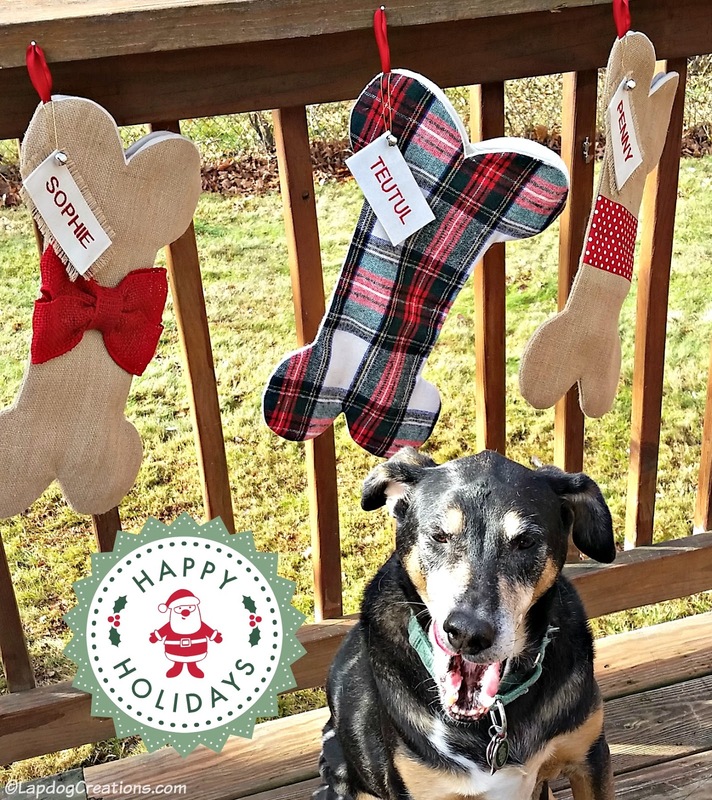 There are multiple color options to choose from for both species, allowing you to truly match each stocking to your pet's personality. The dog bone stockings are offered in several different fabrics, and each option has multiple bow choices. I love the shabby chic look and feel of the burlap stockings, as well as the vintage-looking wool plaid. Best of all, I love that they are all a little different, yet coordinate so amazingly. The bone stockings measure approximately 16.5" long and each one can be customized with a name tag at no additional charge. But, it's not just about looks with these stockings. Each one is crafted with precision, using only high quality materials. These stockings are meant to last! While their Mama is still oohing and ahhing about the stockings, the Lapdogs are just waiting for Santa to come and fill them up. Especially Teutul... waiting for Santa is exhausting! Of course, he thinks that every dog and cat should have his or her own personalized stocking this year! In fact, Teutul even got the Happy Claude folks to offer 10% off to our readers! Place your Happy Claude order by December 15th to ensure delivery in time for Christmas, and SAVE 10% off when you use coupon code HAPPYCHRISTMAS2016 (expires 12/15/16)! Oh yea, those are as cute as can be! Thanks for joining the Thankful Thursday Blog Hop! These are so cute! 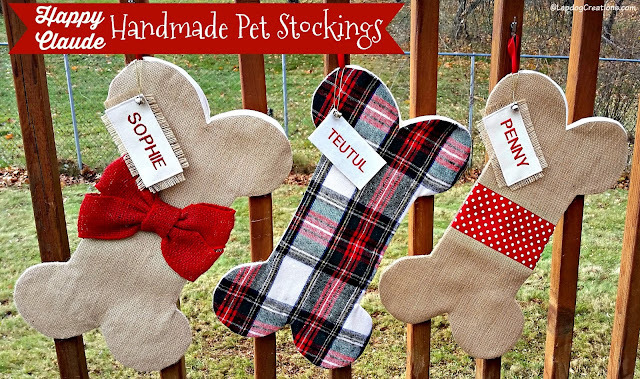 Perfect for our pups that we treat like our children - they definitely need their own stockings filled with goodies!